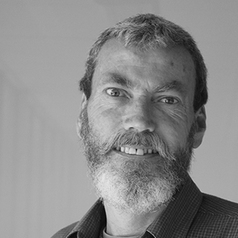 Dr Paul Osmond is a project lead on microclimates with the CRC for Low Carbon Living. He has been engaged with sustainable development since the 1980s, both in practice and more recently, through teaching and research. His connection with this Faculty began in 2006 as a casual lecturer, while working full-time as manager of the former UNSW Environment Unit. In this role Paul was accountable for development and implementation of the University’s Environmental Management Plan, and in particular, integration of ESD principles into campus planning and development. Paul came to UNSW from local government, where he was responsible for delivery of a variety of pioneering environmental management, landscape and urban design programs and projects. His previous professional background includes experience in forestry, freelance technical journalism and the metal industry. Paul has qualifications in applied science, environmental management and landscape design. His PhD research focused on methods for evaluation and design of sustainable urban form. He is a Certified Environmental Practitioner, Associate of the Institute of Environmental Management and Assessment, Registered Environmental Auditor and Green Star Accredited Professional.